The foil motifs of 100 Turkish lira note corresponds with the note design. Tilt the banknote and look at the hologram from various angles, these motifs display colorful and shiny reflections. "TL" letters in the rectangle change into the denomination of the note. 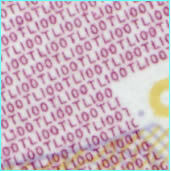 The security thread is embedded in the banknote paper. If you look closely, the letters "TL" and the denomination numeral "100" are visible along the thread from both sides of the 100 Turkish lira note. Concealed "100" can be seen when the banknote is tilted horizontally at the eye level. Tilt the banknote of 100 Turkish lira and you will see different colour effects, shifting into a golden yellow. The denomination numeral "100" and the letters "TL" can be seen on the obverse side of the banknote. 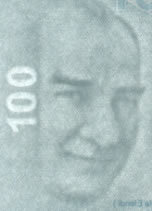 On the obverse side of the 100 Turkish lira note, to the upper left corner of the watermark, dots using the Braille alphabet for visually handicapped, are applied by intaglio printing which are different for each denomination and can be felt with fingertips. The letters "TCMB" on the bottom and top edges of the rectangle on the holographic stripe and "100 TL" within the crescent-star on the obverse side of the 100 Turkish lira note are printed in microletters.